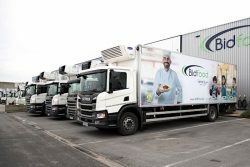 Bidfood Flanders, part of the international Bidcorp foodservice company, has purchased eight Compressed Natural Gas (CNG)-powered Scania P280 carriers. The vehicles will be used for the distribution of food and non-food items for collective catering. “We often drive in urban areas and near schools, which is why we chose these more environmentally friendly trucks,” explains Dominique Binon, Fleet Manager. Bidfood Flanders, located in Kruibeke, is a distribution center specializing in commercial and social catering as well as in delivery to regional wholesalers (hospitals, schools, hotels, fast-food chains, service stations, company restaurants, etc.). The company delivers fresh, dry or frozen products. Bidfood Flanders chose the Scania P 280 CNG with short cab. “It is equipped with a 9-liter gas engine and a CNG tank that offers a range of up to 600 km. That’s enough for the journeys made by our drivers. “Scania gas engines operate on the Otto principle and are equipped with spark plugs as in the case of petrol engines. The on-board computer determines when to replace the spark plugs or change the oil. Scania’s maintenance planning is flexible, depending on the use of the vehicle and the driving of the driver.